Now is the time to own a top brand RV, and you can't do better than the 2019 Keystone Montana 5th Wheel. And at Lakeshore RV Center, we'll make sure you can afford this amazing 5th Wheel at a great price! We're the #1 dealer in Michigan, so we have the best prices and the best financing - in the entire country! We're located in Muskegon, so if you live here or are passing through, drop in and see us at 4500 E Apple Ave Muskegon Michigan 49442 or give us a call at 231-788-2040! Don't live here? Give us a call anyway! We have satisfied customers all over the country, and we can make your RV dreams come true! You and the family will hit the road easily in your 40' 6" 5th Wheel. It's easy to tow and maneuver with a hitch weight of 2460 lbs, ship weight of 13000 lbs, and a GVWR of 16400. When you reach your destination, set up is easy with the 4 slideouts and the 17' 0" patio awning, which means your family will be enjoying the fresh air of the outdoors in shade and comfort! Several people can stay comfy inside this 5th Wheel, with a length of 40' 6" and a width of 8' 0". You won't worry about hitting your head on the ceiling of this 13' 4" tall Montana. The 4 slides provide extra walking room. Stay warm during cold weather with the 35000 BTU furnace, or stay cool during hot weather with the 15000 BTU a/c unit! Not only will you love RVing in this 5th Wheel, you'll love sleeping in it, too! There's cozy furniture for up to 6 people to sleep comfortably! The big Queen bed lets you stretch out and relax for a great night's sleep! If the weather ruins your campfire, you can still cook up a delicious meal with the 3 burner range cooktop. The 66 gallon fresh water tank provides clean water to the kitchen. The 18.00 cu. ft. refrigerator stores enough food for the whole trip! 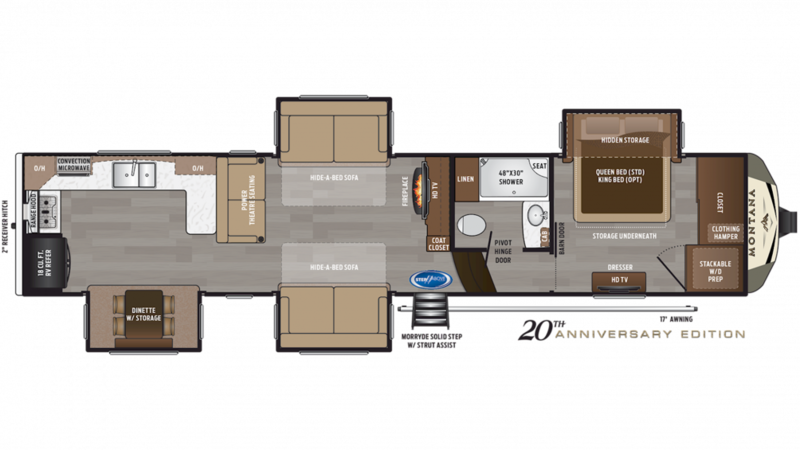 The 2019 Keystone Montana 3700LK will spoil you and your family with its lavish accommodations, including a wonderful full bathroom! It includes a roomy, modern shower and a handsome full sink vanity! Together with the convenient Porcelain Foot Flush toilet, a trek to the cold, messy campground community bathroom will be a thing of the past! This RV has a 88 gallon gray water tank and a 49 gallon black water tank, so there won't be any issues on the road! When the nights are cold, nothing will make your family feel cozier than curling up by the handsome fireplace in this wonderful RV!